Mangers often learn how to lead and manage while doing their jobs. The 'Successful Manager's Handbook' helps you fulfill two of your most important roles as a manager--developing yourself and coaching others. Develop Yourself More than 800,000 managers around the world have used these proven and trusted development suggestions to answer on-the-job questions, build leadership qualities and map their road to success. You can too! Whether you're looking for down-to-earth advice, building a development plan, or working to improve specific skills, this book can help you. Coach Others Never coached before? Need new coaching ideas? Don't worry, effective coaches are developed, not born. 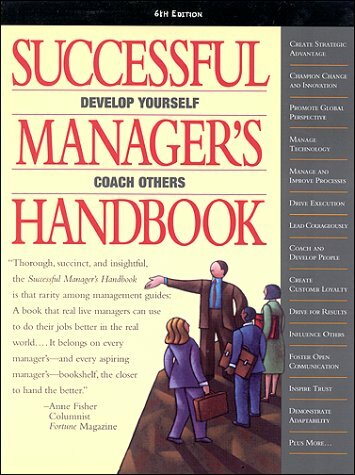 You can use the 'Successful Manager's Handbook' to develop your coaching skills and in the practice of coaching others. This book shows you how to attract and retain the talent you need for success, provide effective feedback, orchestrate learning opportunities, and groom high potential performers.